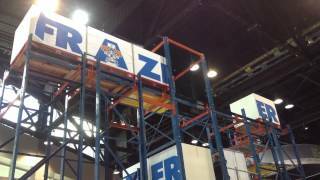 Frazier’s blue and orange pallet rack is quickly recognized for its durability and custom engineered design. From standard pallet rack systems, to complex pick-to belt towers, AS/RS installations or Rack Supported Buildings, Frazier’s expert team of engineers help each customer design the best, most cost-effective storage rack solution. Structural steel is far more abuse-resistant… And we guarantee our storage rack systems to last! This is why our customers are so loyal. They rely on us to produce quality storage rack systems that hold up in the busiest warehouse environments. Frazier is the ONLY pallet rack manufacturer to offer an unlimited 2-year Warranty against fork-truck abuse! Frazier Industrial "The Pallet Mole"